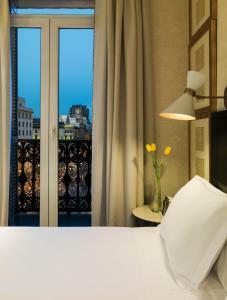 The striking Boutique Hotel H10 Catalunya Plaza is set directly on the square, just 200 metres from Las Ramblas. 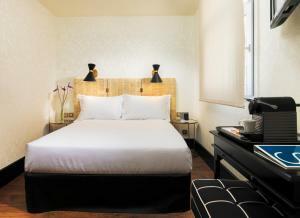 It offers chic, air-conditioned rooms with free Wi-Fi and a lovely chill-out terrace. 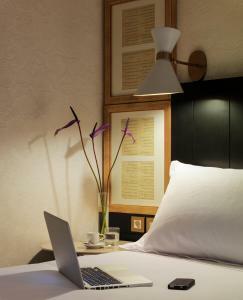 The stylish rooms at Boutique Hotel H10 Catalunya Plaza have lightly coloured contemporary décor. 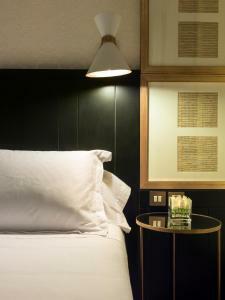 All feature a Nespresso coffee maker with 2 free capsules, an iPod docking station, a safe, minibar and 1 bottle of water per person on arrival. A luxury apartment is also available. Modern bathrooms include H10 toiletries, a hairdryer, magnifying mirror, a bathrobe and slippers. 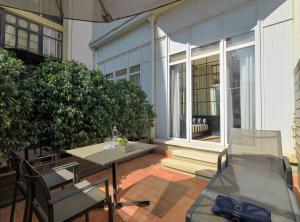 Some rooms also have views of the square or feature a terrace. 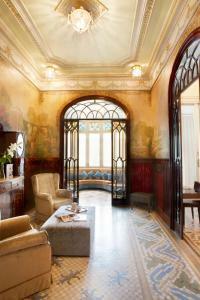 Dating from the 19th century, the hotel combines original ornate tiles, murals and carved wooden doors with modern finishes. 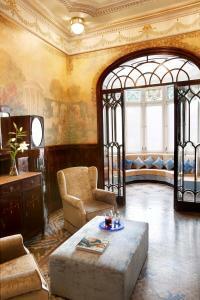 The 1892 Restaurant offers traditional Catalan dishes, a Modernist ceiling and great views of the square. There is also a lobby-bar and a library. 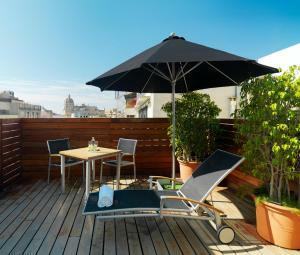 The H10 has a 24-hour reception, where staff can provide you with information on Barcelona. There is also a 24-hour internet terminal. 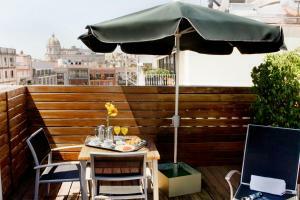 Boutique Hotel H10 Catalunya Plaza is just 20 metres from Catalunya Metro and train stations. The Aerobus shuttle to Barcelona Airport leaves from the other side of Plaza Catalunya. 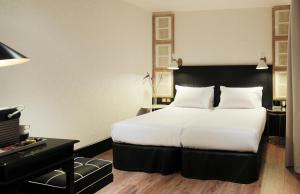 This stylish, air-conditioned room has lightly coloured contemporary décor. It features a Nespresso coffee maker with 2 free capsules, an iPod docking station, a safe, minibar and 1 bottle of water per person on arrival. The modern bathroom features a black and white tiled floor, H10 toiletries, a hairdryer, magnifying mirror, a bathrobe and slippers. Kettles are available upon request. 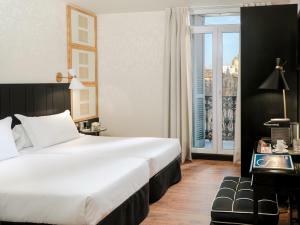 For non-refundable rates, the hotel reserves the right to request, at check-in, both the credit card used to pay in advance and the cardholder’s ID. 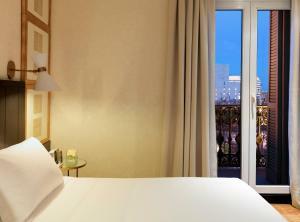 Rate: € 94.33 ... € 263.67; select dates below to get current rates. 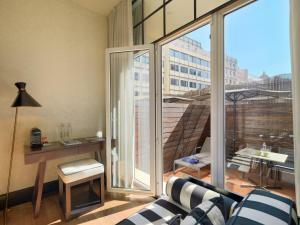 Offering views of Plaça Catalunya, this stylish room has lightly coloured contemporary décor. 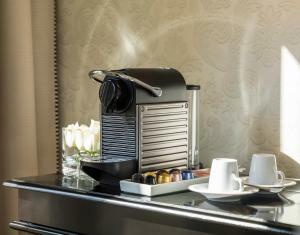 It features a Nespresso coffee maker with 2 free capsules, an iPod docking station, a safe, minibar and 1 bottle of water per person on arrival. 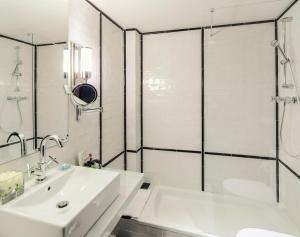 The modern bathroom features a black and white tiled floor, H10 toiletries, a hairdryer, magnifying mirror, a bathrobe and slippers. 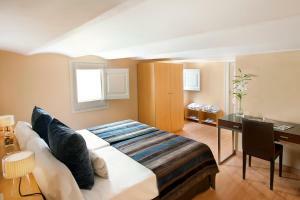 Rate: € 130.00 ... € 155.56; select dates below to get current rates. 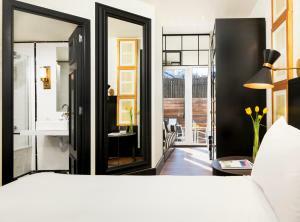 This stylish, air-conditioned room has lightly coloured contemporary décor. 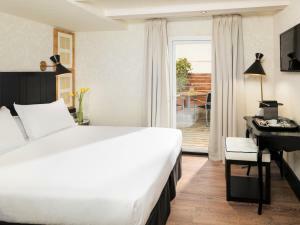 It features a Nespresso coffee maker with 4 free capsules, free Wi-Fi, an iPod docking station, a safe, minibar and 2 bottles of water on arrival. The modern bathroom features a black and white tiled floor, H10 toiletries, a hairdryer, magnifying mirror, a bathrobe and slippers. Kettles are available upon request. Rate: € 69.00 ... € 269.00; select dates below to get current rates. This stylish, air-conditioned room has lightly coloured contemporary décor. It features a Nespresso coffee maker with 2 free capsules, an iPod docking station, a safe, minibar and 1 bottle of water per person on arrival. The modern bathroom features a black and white tiled floor, H10 toiletries, a hairdryer, magnifying mirror, a bathrobe and slippers. This room also includes a single sofa bed. Kettles are available upon request. 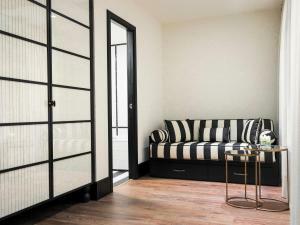 Opening onto a terrace, this stylish, air-conditioned room has lightly coloured contemporary décor. It features a Nespresso coffee maker with 2 free capsules, an iPod docking station, a safe, minibar and 1 bottle of water per person on arrival. The modern bathroom features a black and white tiled floor, H10 toiletries, a hairdryer, magnifying mirror, a bathrobe and slippers. Kettles are available upon request. 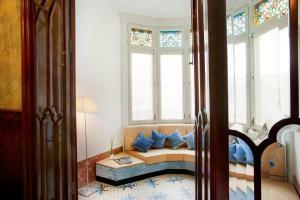 Opening onto a terrace, this stylish, air-conditioned room has lightly coloured contemporary décor. It features a Nespresso coffee maker with 2 free capsules, an iPod docking station, a safe, minibar and 1 bottle of water per person on arrival. 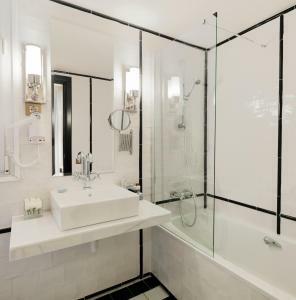 The modern bathroom features a black and white tiled floor, H10 toiletries, a hairdryer, magnifying mirror, a bathrobe and slippers. This room also includes a single sofa bed. Kettles are available upon request. 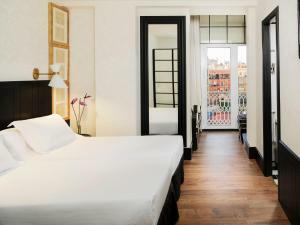 This luxury apartment maintains original 19th-century features, including a gallery looking onto an interior patio, typical of Barcelona's Eixample architecture. It has a lounge with a sofa bed, and a stylish kitchen with an electric hob, an oven, fridge, washing machine, and a Nespresso coffee maker with 2 free capsules, an iPod docking station, a safe, minibar and 1 bottle of water per person on arrival. The modern bathroom includes H10 toiletries, a hairdryer, magnifying mirror, a bathrobe and slippers. There is a twin bedroom.